A three-way battle between PokerStars, Winamax and PokerStars is brewing as the trio of operators prepare to host competing online festivals. Taking the lead over in Europe’s shared liquidity market is PokerStars’ Spring Championship of Online Poker (SCOOP). Getting underway on March 24, the series will run until April 11 and feature 290 different tournaments. As well as low and medium stakes MTTs, the European edition of SCOOP will contain two events with prizepools of at least €1 million/$1.13 million. Just seven day after the start of PokerStars’ SCOOP, Winamax.fr is joining the mix with its own big money event. Dubbed the Winamax Series, the 165-tournament festival will give away at least €12 million/$13.5 million. Topping the bill will be a $2.2 million that costs $141 to enter. According to the accompanying PR material, the event will become the largest guaranteed MTT ever hosted in Europe’s shared liquidity market. However, that record won’t last long as Partypoker is also readying for a major series. Continuing its Powerfest series, the operator will work in conjunction with its French partner PMU.fr to host a $30 million bonanza. 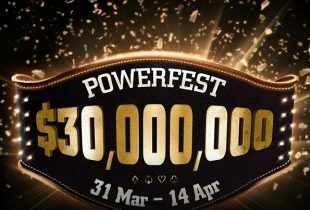 Running from March 31 to April 14, the latest Powerfest will be available to international players and those in France, Spain and Portugal. As well as surpassing its peers in terms of overall value, Partypoker will also host at least one MTT with a $2.5 million prizepool. In doing so, it will break the record Winamax will have set just a few days earlier. For players in Europe, the recent flurry of tournaments is a testament to the region’s strength as a poker market. However, it’s also a potential sign of things to come. As we’ve seen since the start of 2019, PokerStars and Partypoker have been engaged in an ongoing war. The former has been pushing to reclaim momentum after its rival hosted the richest ever online MTT in late 2018. Since then, sit and go tournaments and Twitch innovations have caused the battle to escalate. For players, the end result has been a ton of added value, something that could now spill over into Europe. Indeed, with Winamax looking to steal a march on its peers, some form of retaliation is almost inevitable. That will result in bigger prizepools as we move towards the second half of 2019.